ok, so I'm very annoyed. I'm right handed naturally. I can't do anything with my left hand whatsoever, it's insane! I eat with my right, write with my right, type faster with my right! But whenever I try to do something with my left hand, I struggle horribly. i picked up a violin for the first time this week, as I plan on learning how to play. I picked it up with my right hand & set it on my right shoulder so I was holding the bow in my left hand & it felt more natural than anything I've ever tried to do with my left hand. I tuned my violin & it felt great using my left hand, so I've decided to learn how to play with my left hand. but now everything I find is basically saying that I cannot play my right handed violin with my left hand & it's driving me mad. Trying to play right handed feels extremely awkward & wrong to me. Is there anyone who plays left handed that can give me tips? She plays a right handed violin, left handed. left handed violins are available. It's all in what you get used to I guess. I think my left arm would fall off if I tried to bow with it. The biggest problem I have with my left hand is that I clench up on the E string. If you can play on a left handed violin and it feels good to you, I don't see why not. Just a cautionary note - just because it seems easier now doesn't mean that you'll play better that way in, say, a year's time than if you played the conventional way. 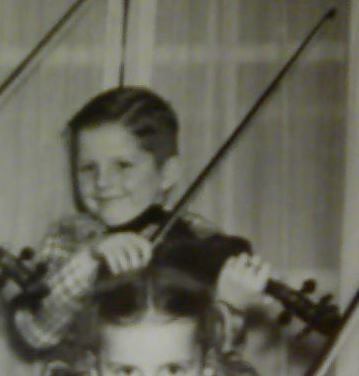 I'm well into learning the violin now (18 months or so) and I'm glad my best hand is controlling the bow, believe me! It's the most critical bit as far as I'm concerned. On another note, anyone who has aspirations to play in any kind of orchestra should beware of playing left handed, even on a left handed violin. You won't fit into the section and won't make friends with the person on your right when you stick your bow right in their ear. In the classical world even lefties invariably play right handed. But if it is really more comfortable for you to play left-handed, then that's the way to go. I can't really think of any reasons why playing a regular violin left-handed would of itself be all that "bad".. But if you mean stringing it in reverse, the right-handed instrument isn't really made for that, due to the bass bar inside that is supposed to help get more sustain and tone from the low strings, and any graduation of the thicknesses of different parts of the top and etc would have been done with the standard right handed stringing in mind. But if you mean just taking the thing and playing it on the right shoulder instead of the left, that shouldn't result in it not sounding as good, I don't think. You'd have to adapt pieces or technique for some things, sure. But any lefty has been doing that all their lives, anyway, since the world is made for the "righties". I am left handed too and I totally understand the struggle! I bought a lefty electric violin but was told by my teacher to get a wooden one. Needless to say I couldn't get one here in Oz so I bought a right handed one. Tried to play it right handed and was in agony! So I just put it on my right shoulder and its so comfortable!! I've only been playing a couple of weeks...and tonight I played Twinkle Twinkle by ear! Ok so my strings are upside down but it still sounded great! Personally, I'm just gonna play how I'm comfortable, and enjoy the ride! Although it's probably better to play right handed, if that is really uncomfortable or painful, or just plain doesn't work, and you are not planning on playing in an orchestra, lefty is probably fine. Better that than to give up! Funny, after reading this thread, I put my violin on my right shoulder and found that my right wrist won't twist around enough to comfortably reach all the strings! If I hold my hands out and twist them, both wrists have equal range of motion, but in violin position, the left one is a lot more flexible. I am right handed, but I had to teach myself to use my left hand to work the computer mouse to avoid wrist pain on my right. I'm glad the left hand is the one heavily used in this case, because I'm sure I'd get carpal tunnel if I had to use my right! Anyawy, listen to your body, go with what works, and enjoy playing! We have a few nice Chinese workshops who will make left hand violins for us if you like. They would need a couple of months though. The top, neck and fingerboard are a bit different plus the bass bar gets mounted on the opposite side (bass side) of the violin. Obviously the sound-post, bridge, nut, and peg holes are reversed as well. Even the chinrest is hard to find. Now a days they are making more left handed stuff simply for the demand but as you probably know, left handed people play the violin the same way as right handed players. If you are looking for a cheap version, we sell the Cecilio left handed violins. Out of curiosity, does it feel too awkward to try bowing with your right hand or finger with your left? Maybe you could train yourself to play right handed, if you wanted to that is. Kinda like when you break your arm and have to learn how to eat and write with the other hand. But yea I had a similar experience when a friend was teaching me guitar. Im left handed normally but the guitar felt more natural strumming with my right. Cool Im not the only one this has happened to lol. Don't get stressed get Straussed! Welcome to the forum, I also play left handed on a right handed fiddle. The big draw for me of playing a right handed fiddle left handed and not getting a left handed fiddle was selection, when I learned the guitar I change the strings around and made a left handed guitar problem is all of my friends guitars I cant play, so unless I have mine I cant play. So when I started playing the bass guitar I used a right handed bass left handed, now any where I go If there is a handy bass I can play it, I'm not strapped to a left handed bass only, Just my two cents. It is a bit confusing to watching a right handed person play, but very doable the Video above of Katrina Nicolayeff is proof positive it can be done and done extremely well. Some time it takes some adjustment from standard teaching but with a little work you can figure it out. There are left handed chin rests available I can supply you with the information on the one I use if you want it, I had tried 3 others before I found this one If i can be of any help please let me know, I believe you the 3rd or 4th Lefty I know of on the forum so your not alone. I joined this group yesterday. I have seen many lefty guitarists play righty guitars lefty, righty and upsidedowny to at the very least equal standards to the 'normal' configuration, so I don't see it as too much of a problem if that is the way you choose to go. I hesitate to say this, but for me at least, consistency of position for playing the violin is paramount, and was my biggest hurdle thus far in my 8months of playing! The Bonmusica shoulder rest was the difference between my violin becoming firewood or the sensational addictive incomprehensible beast it has now become in my life. I often forget to promote the Bonmusica but you are right. This shoulder-rest is loved by so many faithful users. The way it curves over your shoulder to keep the instrument from slipping down is fantastic. Eliminates the need for extra squeezing and tension.